England Morning Dress, April 1796. 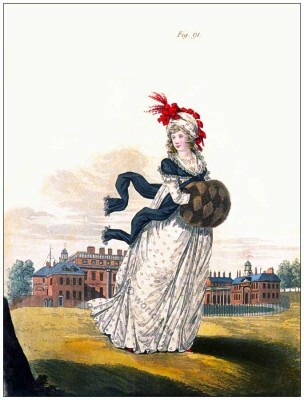 Home » England Morning Dress, April 1796. The front hair combed straight upon the forehead, the hind hair turned up plain and short. Bonnet of white satin, in the form of a turban, trimmed with coquelicot-coloured satin riband, and with plumes de coq of the same colour. Round gown of muslin embroidered in blue; spencer cape; short sleeves, and short upper sleeves of plain muslin, trimmed with edgings. Chemise tucker. Black cloak, trimmed with broad lace. Red morocco shoes with high white heels. Fur muff. This entry was posted in 1796, 18th Century, Accessoires, Directoire, England, Gallery of Fashion Vol.3, Georgian period and tagged Muff, Neoclassical dresses, Nikolaus von Heideloff on 5/13/13 by world4.